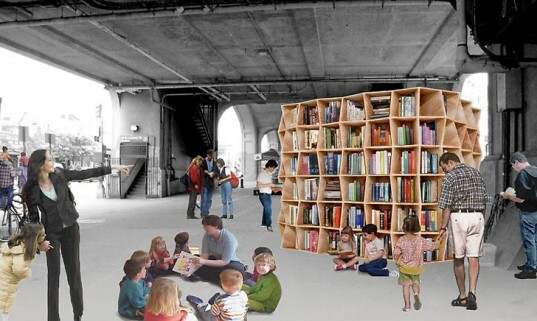 The Uni Project is a "portable reading room" designed for urban spaces by a design firm in Boston for musician, philanthropist and former NY Legal Aid Society attorney Sam Davol. The first Uni Project is scheduled for New York this fall. Davol's idea is to improve on the venerable bookmobile by adding features like furniture that encourages community members to hangout and enjoy the books and each other. The module is made of boxes that hold books enclosed by pieces that come apart to re-configure into tables, benches,and chairs. Thus, you have all the portability and protection for the books that you have with a bookmobile, plus you have added a community-building aspect, if Davol's idea is correct. It is aimed to improve literacy, but can also be used for open air meetings, arts and crafts, classes, and more. Boston Street Lab is the 502(c)(3) organization which the Davols have created to fund and staff the Uni Project, though it also ran a storefront library in Chinatown in Boston, for less than a year, and several other initiatives. Mr. Davol and his wife plan to drive the first uni reading module from Boston, where it has been built, and hold a kick-off. They have already held an online fundraiser where they managed to raise more than the targeted $20,000 for the project. It is striking that, while Mr. Davol has volunteer librarians who are Simmons Library School 8/07/the-uni-project/">graduates lined up for the Uni Project, the project is not involved directly with any public libraries. At least as far as I can tell from any of the articles on the web or in papers I have seen so far, there is no connection to the official library community. I cannot tell if this is a decision by the Davols or if they reached out to the library community and were rebuffed. Perhaps they were thinking that if they wanted to be offering books on the street level, they were operating in a different social sphere than libraries. It will be an interesting experiment to watch. Hooray for private philanthropists who see a need and just act to fill it! I do wish there were some link to the library community. And I cannot but be wistful that this will be showing up in NYC first, though designed and built in Boston.